(C)2002-20** USAGI-CHANG RECORDS. All Rights Reserved. 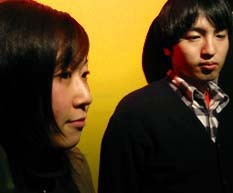 '99年結成。超Hi-SPEEDでcute & happyなelectro guitar pop!! 04 : Smash!! Flash!! Splash!! 1 : sunny side up! 02 : 夏を待てない / SOUL-D! V.A. / killer killer USAGI-CHANG!! 03 : well this is a quize! answer in a minute! 08 : my summer summary / Spaghetti Vabune! bluebadge label 01 : Chocolate Song / スパゲッティ バビューン! TOP | USAGI-CHANG? > SOCOPO | CATALOG | LINK | ???? ?